Perry is approached by a young woman named Dorrie Ambler who wants him to verify her identity. A seedy private eye has been paying her to frequent certain places around town and Dorrie thinks it�s because she resembles someone else. Paul learns that this is true: Dorrie looks like a spoiled heiress named Minerva Minden. After some checking, Perry discovers that Minerva was supposedly involved in a hit-and-run accident, and it looks as though Dorrie is being used to prove that. But why? Blackmail. At least that�s what it looks like. But when the blackmailing private eye is killed, Perry learns the truth. Dorrie Ambler is Minerva Minden. She wasn�t hired by the dead man, she was being blackmailed by him. The question is: Who is the dead woman burned beyond recognition in the car accident but identified as Dorrie Ambler? Ray Collins, Adieu (Pt. 1): This is the final episode of season 8. It also marks the final appearance of Ray Bidwell Collins as Lt. Arthur Tragg. Sadly, Mr. Collins would die during the summer of 1965 from emphysema. This episode also marks the final appearance of Wesley Lau as Lt. Andy Anderson. Submitted by PaulDrake 33, 8 August 2009. + Oh, the curse of ever-expanding commercial breaks! In a well-used syndication print, Ray Collins does not appear in this episode. So for many viewers, alas, this is but the last of several episodes in which he merely received billing. (See below.) Submitted by gracenote, 5/9/2011; updated 6/10/2011. ++ FredK may be right that the man was intended to be a stunt double. In any case, it clearly is someone other than Tragg who gets out of the car. Submitted by gracenote, 2/12/12. +++ In resolution of the above disagreement: Ray Collins does not appear in Ep 241 TCOT Mischievous Doll. The scene described above with Tragg at the desk advising Anderson to "make Perry Mason your chief suspect" does indeed appear in Ep 196 TCOT Capering Camera from Season 7. This was, on 16 January 1964, Ray Collins' final appearance on screen. He was, however, included in the credits throughout the rest of Season 7 and all of Season 8. 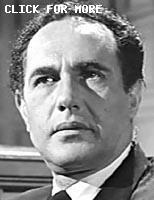 He died, as mentioned above, on 11 July 1965, during the summer hiatus between seasons 8 and 9 of the show. Uncredited Actors: Don Anderson makes two appearances in this episode. First, he�s part of a couple who observe Dorrie/Minerva shooting a pistol at the airport. Later he�s a spectator in the courtroom gallery on Burger�s side. Submitted by FredK, 21 April 2011. + The scowling cop standing by a car as Perry and Lt. Anderson talk is Robert Wegner, to whom this wiki has a page dedicated. Submitted by gracenote, 5/6/2011. Location: The Courtyard apartment complex plays double duty by appearing again in �TCOT Dodging Domino.� Submitted by Eric Cooper, 28 April 2011. Character Names: We learn from Burger that Jasper�s first name, omitted from the credits, is Clyde. Submitted by gracenote, 5/6/2011. Sightings: Among the horrified bystanders at the airport is Distinguished Gentleman #1, who confers with Don Anderson (see Uncredited Actors, above) among other fellow witnesses (behind Paul Drake). Having recovered from his shock, the Gentleman proceeds to play the court reporter during the evidentiary hearing, while a Pencil Mustache Man observes from an aisle seat behind Perry. Little Old Lady #1 and Quiet Old Man #1 also turn up�the latter magically teleporting between a seat behind the defendant and a seat behind Burger. Submitted by gracenote, 5/6/2011. + To find out who these people are, see the page appropriately called Who Is That? This is the last episode of the TV series to be based on an ESG novel (and not a remake). Between 1963 and 1965, ESG published 7 Perry Mason novels that never were adapted for the show. I don't think it was a mandatory time lapse between the book and the adaptation. Look at Deadly Toy, published and filmed in 1959. So why didn't these 7 make it to the small screen? Musings by Bill-W2XOY on 08/01/2013..
More musings. Why did Wesley Lau leave after Season 8? Did he want more money? Did he want opening credits after the death of Ray Collins? I've never seen an answer to this. Submitted by Bill-W2XOY on 08/02/2013..
+Wesley may have left to play Master Sergeant Jiggs on "Time Tunnel"'s lone 1966-67 season. He was in 5 of its 30 episodes: 4 airing in '66 & 1 in '67. Mike Bedard 2.5.15. Ben Cooper's accent in this episode isn't bad; it's dreadful. Submitted by Dan K, 5/28/16. In the opening scene the cab pulls in behind a parked Chrysler. When Dorrie exits the cab, the Chrysler is gone. Judging by the puckered stitching at the shoulders, Perry needs a new tailor. Why did Minerva need to involve a detective in the first place? 'A Pitkin by Any Other (First) Name." In the original ESG novel, Clyde Jasper's first name is Dunleavey. Might he be related to the equally inaptly named Cartman Jasper from "TCOT Duplicate Daughter" (Episode #121)? Submitted by BobH, 2 July 2018. Season 8 concluded with two episodes featuring very questionable crime-scene work (aside from the also very questionable intelligence of Perry's clients.) In Wrongful Writ, the DA's office failed to establish where, exactly, the crime took place before the preliminary hearing began. And now, for Mischievous Doll, Lt. Anderson and colleagues misidentified a body "burned almost beyond recognition" by using only a partial fingerprint and hair color. Why couldn't they use dental records? No one even mentioned them. One consolation (besides Sgt. Brice getting a closeup and several lines to speak) could be that at least Perry's last client was willing and easily able to pay his fees. Submitted by (lowercase, with a comma and period) masonite, 07/03/13.